Here' s the one that started it all! We developed the Kestrel 1000 -- Pocket-Wind Meter in 1995 when NK co-owner, Richard Kellerman, needed a reliable wind meter for flying his glider. Over 10 years later, it looks a little slicker, and it still gives you the reliable, accurate wind measurements that you need. Every Kestrel Meter features a large, 1ý impeller mounted on a sapphire jewel bearing, which means it starts rotating with the slightest puff of air ý 0.3 mph to be exact! And this unique impeller is user-replaceable, too, which means it can easily be replaced if it is damaged or worn. If your application demands regular calibration , simply pop in a new impeller and the Kestrel Wind Meter is restored to like-new factory calibration standards. 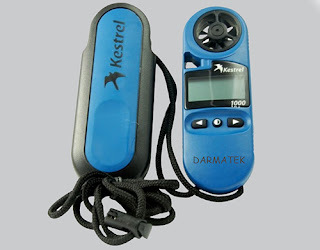 The Kestrel 1000 -- Pocket-Wind-Meter can easily be switched between mph, km/ h, ft/ min, m/ s, knots and Beaufort.